Security at railway stations and airports across the country has been stepped up. Volgograd is situated in the south of the country but quite far from any hotspots or cities of federal significance and nearly 700 km from Sochi, which will be hosting the 2014 Winter Olympics. Yet for the second time in as many months it became a scene of a terrorist attack. The latest one would have had far more devastating consequences had it not been for security measures in place at the railway station where the explosion took place. Now security at railway stations and airports across the country has been stepped up. They say that a projectile does not hit the same crater twice. But Volgograd, which is situated far from any “hotspots”, has proven this observation wrong: the city has become the target of a terrorist attack for a second time over the past two months. Two months ago a female suicide bomber blew herself up on a passenger bus. Now a blast rocked a railway station, Volograd-1, in the center of the city. Vasilisa Vasilyeva works at a deli in a building opposite the station. "The explosion was so strong that the whole of our building shook. We even thought that we were blown up. We ran outside and saw that it was the station. There were people lying on the steps near the main entrance, all the windows were smashed and there was black smoke coming out of the central windows on the second floors, where the statues are," the girl says. "The station clock stopped at the moment of the explosion, at 1307. My boyfriend, Pasha, started to call a friend of his, who is a policeman at the station. He picked up but said that he was wounded and could not talk. We realized that things were really bad." According to preliminary reports, the explosion killed 16 people and left 37 injured. Of the latter, only seven people have minor injuries, while all the rest are in a serious and some in critical condition. One of the injured is a nine-year-old girl, she is being prepared for surgery. The first ambulances and fire engines arrived at the scene almost immediately, just several minutes after the blast. The police cordoned the building off, sniffer dogs and mine-disposal experts were working at the scene. According to eyewitness accounts, one of the passengers, a woman, like everybody else put her bag on the belt of the x-ray machine at the entrance to the station and walked through the metal detector. That’s when the explosion took place. Additional security measures introduced in the city after the suicide bombing in October had been eased but the law-enforcement services continued to be extra vigilant and the x-ray machines at the station were there not just for appearance’s sake. They were working for real. As it turned out, that was not enough and the city remained vulnerable. The explosion killed and injured those people who just happened to be near at the time. Soon after the incident the National Antiterrorism Committee announced that the explosion may have been carried out by a suicide bomber. A criminal case has been launched on charges of terrorism and illegal possession of explosive materials. Valentina Ustinova and her nephew Ivan Konovalov were on their way from the town of Kizlyar in the Caucasus to the city of Ulyanovsk, via Volgograd. At three o’clock they were due to get on the Kislovodsk-Yekaterinburg train. They had several hours before the connection and took a walk around the city but then returned to the waiting room at the station. "First, there was a popping sound," recalls Ivan. "I thought that somebody popped a Christmas cracker. And then there came a real bang, the windows were shattered, there was fire. I only had time to cover my face with my hands." "Although we were far from where the explosion took place, my fur coat was singed by the flame. We immediately tried to get out through the window. I did not want to look at the scene of the explosion: there were fragments of glass and blood everywhere." Svetlana Demchenko and her friend happened to be near the scene of the explosion. "I was blinded by a flash and fell on the floor. That was what must have saved me," says Svetlana. Tatyana and Lyudmila work as cleaning ladies at the station, they look after the central section of the building, where the metal detectors are. At one o’clock their lunch break began and they both went down into the staff room in the basement. Literally several minutes after that their usual working place was rocked by the explosion. 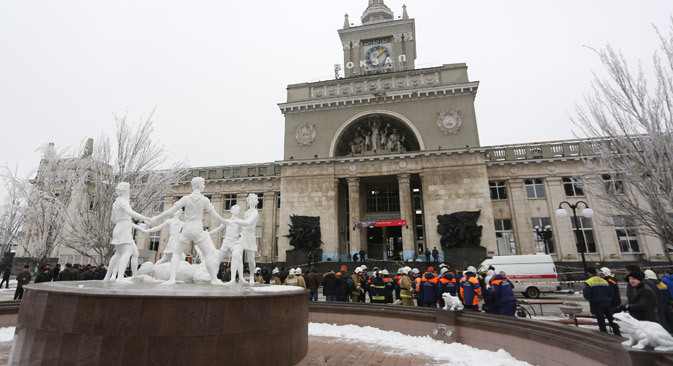 The terrorist attack has caused numerous delays for other trains that were supposed to pass through Volgograd. An hour and a half after the attack, the administration of the local railways directorate arranged an alternative route for them, via the local train station, which is situated across the road from the main one and is linked to it via an underpass. Thousands of passengers and people waiting to meet their loved ones gathered in the streets near the cordoned-off railway station. Volgograd Region governor Sergei Bozhenov has promised that the victims’ families will be paid a million rubles each from the regional reserve fund, irrespective of where the victims were from. Those who were injured will be paid 200,000 rubles ($6,100) each, with the amount likely to be increased for those who have serious injuries. "All the municipal services are working in a regime they practiced back in October. Everything is the same," Bozhenov said. "I would like to stress that there is no fear or panic among Volgograd residents. The city’s hospitals have all they need to help the casualties. We are also in touch with Moscow hospitals and if necessary will be sending people there. An Emergencies Ministry aircraft is getting ready to leave Moscow if there is a need to bring any casualties there." Those of the casualties who have the most serious injuries have been taken to city hospital No 25, the nine-year-old girl has been taken to hospital No 7. Most are suffering from blast injuries and burns. So far experts have not been able to explain why Volgograd has become the scene of a terrorist attack once again. The Russian Interior Ministry’s press service has told Interfax news agency that security at all transport hubs across the country has been stepped up.